Ok, here's the deal. You can pick any run you've ever done and enter it in the bizarre run 2007. I will list the post here, so that readers can read about your bizarre run on your blog. Then they can come back here on November 5th and start voting. My bizarre run is from the past. Who else has a bizarre run? Give me the link and I'll post it. You can even have more than one. Neil lost 33 pounds this week. Yes, this week. But, we all saw that coming since he had a 17 pound water weight gain last week. This, of course, helped Bob's Waddlers and Jeff's Former Fatties retake the top two spots. David was voted off. He was a popular contestant. But, only Tigger had him on his team. See the latest standings. Time to take my Honda Pilot SUV in for some routine maintanance. They suggest you get a new timing belt and water pump around 60,000 miles too. I hate to throw away a perfectly good timing belt, but if it goes while I'm driving, the cost is a lot more. So, they say. And since they have the engine torn apart you might as well do the water pump. So, they say. I figure I can take the SUV to the dealership which is a little more than 6 miles away and run home. David, the service writer: Do you need a ride home? Me with chest puffed up in pride: Naw, I'm running home. David, the service writer: How far is home? Me, proud as can be: Oh, just 6 miles. Luckily David didn't follow me. About 1.8 miles into my easy run, I'm dieing. I'm dizzy and down to a walk. Guess that bowl of cereal this morning wasn't enough fuel to get me home. Luckily, I was near a gas station. I stopped there and got a gatorade X Factor and a Reese's candy bar. They were great. I got my pep back and made good time for the last 4.5 miles. You can tell were I was dragging by the graph above. I propbably walked close to a half mile. My run this morning was 6.64 miles total and that's after doing a 6 miler last night around 7 pm. Which gets me over 100 miles for the month of October. My first ever century month and first month I ever ran two half marathons in. Ideal for Bizarre Run #2 didn't work. I had another ideal, but it didn't work out. I don't think it was big enough. Anyway, I got a normal run in today. 6 miles in a little over 73 minutes. I ran around my neighborhood and only walked twice. Three times if you count the time the two dogs came up to me. But, they were freindly and I was back on my way in no time. I was happy that I could get in a good 6 miler two days after the half marathon to forget. Next year I'm going to do it again and I'm gonna smoke that race. Tomorrow, I have to drop my car off at the Honda dealership. It's six miles away. Guess what I plan to do? Run home. Nope, I don't consider that bizarre. Have you done your bizarre run for October? If you want to show off the run, let me know about it, tell about it on your blog and I'll post links to all the bizarre runs on Halloween. Then, we'll let everyone vote. Heck, if you win - I might just send you something bizarre. Another view of the YMCA race. Check out the elevation. Now I know how it feels to be a cockroach trying to get out of the bathtub. Actually, I was toast long before the uphill portion of this race. The first two miles I did in 20:23, a PR for that distance. Thru 9 miles I was on a 12 minute pace. but, after that I was a cockroach in the bathtub and I couldn't do anything but claw my way out. I wasn't going to mention this, but I will. MARIA MONTEJANO beat me by 4 minutes. I was on the uphill portion of the run and actually doing a very slow jog when I felt this hand on my side. I thought someone was taking my water bottle. It turned out to be Maria. She put her arm around my arm and jokingly asked for assistance up the hill. I laughed, we talked and she held on as we slowly jogged for a bit longer. Then we separated and a few minutes later she's by my side again and she could tell I wasn't doing well, so she offered to pull me up the hill. Maria finished second in her age group and I was there at the awards to congratulate her. Of course, since she finished second that means I got grandma'd at least twice by women in the 60-64 age group. One of the bright spots of my day was getting to meet Maria. The reward for the rough half marathon yesterday was a new low on the scales today. 1.5 pounds lower. 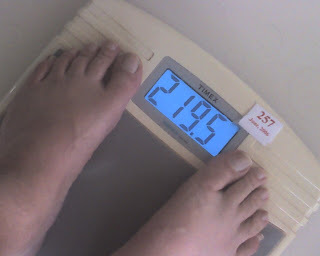 I was actually down to 218.5 right after the race, but I knew that wouldn't last. Hopefully, I won't creep up anymore. And I made it over 1000 miles lifetime at the end of this run. So, I can remember my 1000 mile as being a brutal uphill climb into South Mountain park. My legs feel great today. I feel like I could run today, but I choose not to do the 5k at Kiwanis Park. I might do an easy 3 miler tonight. Right before my eyes opened this morning I was in line at Starbucks. The line was long and since I flunked SSL (Starbucks as a second language), I was getting laughed at by everyone in line as I was trying to explain to the girl behind the counter what I wanted. Then I awoke. I think Javamom was one of those in line laughing at me, but I'm not sure. I had breakfast and read some blogs. Dan mentioned SOMA and another blogger running the quarter. Dan got me excited about SOMA, so I grabbed my camera and hit the door. My camera worked for one photo before the batteries died. With no new batteries I used my camera phone for all the rest. It was crazy. The bike route went left and right and over the bridge and back again. I did notice that fans (including some athletes that were done) don't watch for runners when the cross the course. I thought about taking pictures of near collisions, the volunteer near the finish said he saw at least 5 close calls and he was helping to stop the traffic across the course. 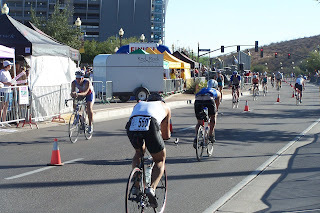 I kept one athlete with a bike from running into a runner 50 yards from the finish. 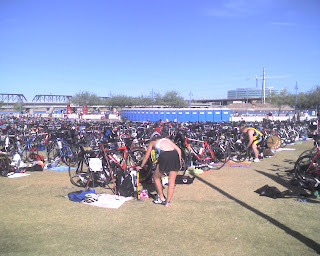 The transition area was huge. Some athletes were hurrying and some were taking there time. These runners are about 300 yards from the finish. Check out the bikes on the bridge above. Looks like my son's room. Maybe he could be a triathlete. If you haven't been to Tempe, AZ lately you wouldn't recognize it. High rises are growing all over town. This weekend was big in Tempe. Not only was there all the athletes and fans for the tri, but the Sun Devils beat California last night in front of 70,000 fans. The volunteers were great. The one in front of the semi helped the trucker get thru by moving signs and only one athlete was slowed on the bike course. 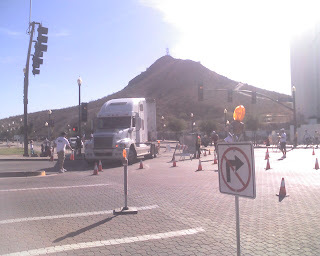 Down this road on the other side of the butte is the finish for the Arizona Rock and Roll Marathons. 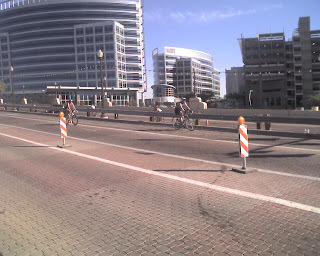 The finish of the bike course had a 90 degree turn into the parking lot. In a 15 minute window I saw 2 cyclists almost wipe out. I got home and got to see this fly by over my house. 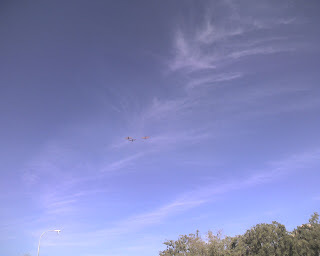 You might see the three planes if you click on the photo. This week I really tried to watch my calories and I think I got a bit dehydrated too. This morning was the 39th Annual Downtown YMCA Half Marathon and I wanted to make sure my fueling was just right. I woke up at 5:20 am and ate a peanut butter and banana sandwich. I forget who, but that's someone's sandwich of choice on race morning. You know who you are. I packed 4 gels. Three of them were Carb Booms, which I was trying for the first time. One was a PowerBar double espresso gel, which I really like. None of it helped. As you can see on the chart, I bonked at around 9 miles. 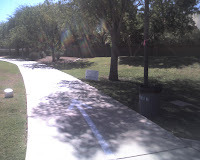 We started in South Mountain Park and immediately got on the street and left the park. The first mile and a half was downhill. It was hard to hold back and I was running some of it below a 9 minute pace. I slowed down and hoped I could conserve my energy, since I had to climb this hill on the way back. 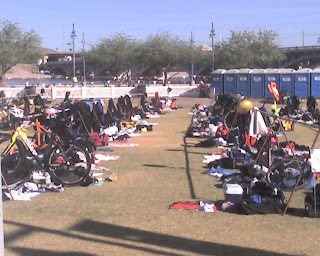 Here's a view of some of the runners visiting vendor tents before the races. 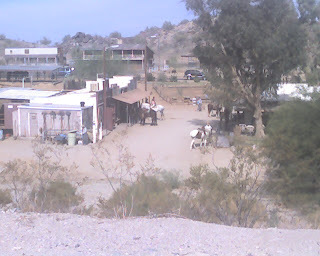 Running out of the park you pass the horse stables. 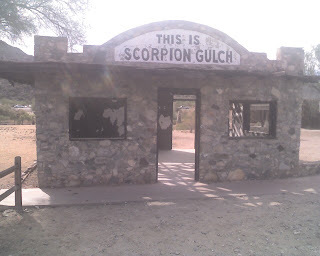 And Scorpion Gulch. This isn't used anymore. I guess you could call it an abandoned tourist trap. About two miles into the run we got off Central Avenue and onto the canal. 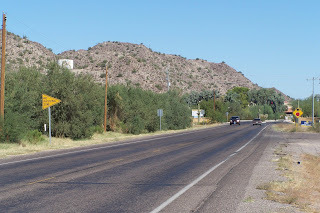 The asphalt was not in good shape all along the canal, but we did have great views of the mountains to the south and downtown Phoenix to the north. I ate my gels at 3, 6 and 9 miles. On the way back I got to talk with several runners. This kept me occupied, but I was feeling fatigue in my calfs around mile 9 and was reduced to walking. Two weeks ago I felt great the entire run. I think I started this race dehydrated and it just got worse until my legs felt like lead. I walked more than I ran the final three miles. Going up hill into the park you run along the open street and in car after car you see runners eating bagels, drinking Gatorade looking into your eyes and feeling your pain. They finished along time ago, I still had some unfinished business. And since this was a training run of 14 miles, I knew I would have to do 9/10 of a mile after the finish line. I turned left into the Parks parking lot and I could see the finish line and 3 runners in front of me running, but running slow. I decided that I wasn't going to walk across the finish line. And, if possible I was going to pass the other runners. I kicked it in gear. Checking my garmin later I see that my pace went all the way down to 4:54 at the finish line. I passed two of the runners easily and the third one I passed with the official at the end pointing toward me. I passed her too. What did I get for my troubles? An apple and some Gatorade. My garmin said I finished 13.1 in 2:46:30. The official time was 2:49:05. Either way, far from my PR of last week. 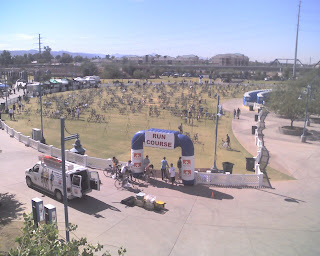 Afterwards I went home, showered and took my daughter and wife to the SOMA Triathlon Expo at Tempe Beach Park. Tomorrow, if I get up I will go to the triathlon. And yes, after the race I got my mileage for the day up to 14, the longest I've ever ran. Since I have to run 14 miles this weekend and many of my running buddies can't make it, I decided to enter a half marathon. The 39th Annual YMCA half is at South Mountain Park running alond the canal on Saturday. So, I'm tapering yestereday and today. I have a softball tournament game tonight at 6:30, so that's cross training, right? Then the half tomorrow morning. Amy and I will be going to the SOMA Triathlon Expo on Saturday and then I will get up early to go watch the athletes swim, bike and run to glory. 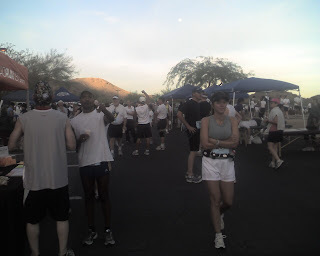 I'll miss the Ghost and Goblins 5k, but I'll make our friend, Jennifer's annual Holloween Picnic at Desert Breeze Park. I'm the grill guy for the big occassion. Yesterday I shopped at Sole Sports, a running store and met Katie Ellis. She works there, just graduated from Arizona State University and just won the Best of the US Triathlon down in Florida. Only one man and one woman from each state competed. I asked for an interview and you can read it at our Rock and Roll Marathon blog. Fartlek. Don't you just love that word? Or maybe this was a brick. First, Tyler my son, and I went to our Japanese Swordsmenship class. It was just our teacher (sensei), his assistant and the two of us. We got lots of attention. After two hours of that, I got home jumped into my running gear and headed out. The block my home is on is 1/3 of a mile around. My plan was to alternate fast and slow laps around the block. The first one was slow at a 10:46 pace. Then I picked up the pace for the second 1/3 of a mile. The pace was 9:37. Then a slow one at 11:06. Then they started getting slower and slower. It wore me out, but it was a good run overall. 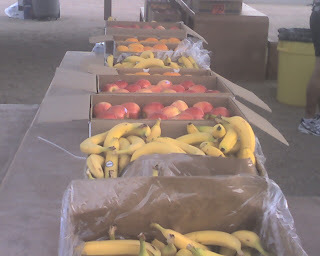 Environment Tip: Plastics are filling are landfills and I figure I need to do my part to decrease my use of plastics. So, I try not to use the plastic bags. I carry my purchases or I bring my own bag. I, also, pass on a straw and plastic top when I drink my soda at the restaurant. Just think of the millions of straws that are used every day, thrown in landfills and sit for 300 years. I bought a new book today. The Runner's Diet by Madelyn H. Fernstrom. It's a book from Runner's World. So far I've only read the intro, but as I read it I will pass along tidbits from the book. Thanks to Iron Misty for recommending the book. If you haven't visited her blog and you'd like a good laugh, go there now and do not pass go or collect $200. Tonight I taped "Biggest Loser", got my running gear together and headed out the door. With the garmin I can run anywhere I want. No need for a course, garmin will tell me when I am finished. I got 6 miles done in 75 minutes. Environment Note: We take a half gallon milk jug, clean it out and fill it with water. Then we put one in each of our toilet water reservoirs. Now, each time we flush, we flush a half gallon less water. Edit: I just found the above link that explains it better than I did. Last year at this time I did 3 runs of 4 miles each. 12 total miles. This saturday I'll do 14 in one day. My longest run ever. I weighed 240 pounds. Now I'm about 17 pounds lighter. I ran the Ghost and Goblins 5k on the 29th. It was my second run ever and I did it in a PR of 34.35. Sunday, I plan to run that race again. The Biggest Loser: How can you gain 17 pounds in one week? Neil, of the biggest loser explains that each gallon of water weight 8 pounds, so all you have to do is drink two gallons of water right before the weigh in. That's what Neil did to get his new 3 man team below the yellow line and in the elimination. The team formerly know as the Blue Team wanted to get rid of either Jez or Isabeau. In the end, it worked and they eliminated Jez. Bryan of the old blue team also gained a pound. At least this makes the show much more interesting. And it makes our fantasy league that more interesting too. Lots of changes this week as some teams gained weight. Tiggers hate honey and Pat's Pounders moved up to first and second place. Bob's Waddlers dropped from 1st to 5th and Jeff's Former Fatties dropped from 2nd to 6th place because both teams had Neil as a member. How Neil didn't get eliminated, I have no ideal. The question is will Neil have a huge week coming up? The 17 pounds of pure water should be easy to get rid of and he's know for putting some big numbers up. If so, Bob and Jeff's teams will be right back up top in one weeks time. If you haven't watched "Biggest Loser" next week might be the week you want to watch. Funny, after the weigh in the cameras found Neil up in the bathroom. I'm sure he ran there fast. Another Run, another weigh in. Last night I read Mike's blog up in Wisconsin and how he was underfueled for a 10k and bonked. Then I ran and felt undefueled right from the get go. I toughed it out and got in 5.3 miles before I needed a bathroom break. The middle of the run was actually fine. I weighed in this morning at 223.5. I've been there for a week now. After running 23 miles last week, I was hoping to lose a bit. I need to start watching my caloire intake. I now have a daily sheet I am going to fill out and try to minimize the calories in. Tonight is "The Biggest Loser" on NBC. I believe they are going to disband the teams and do something different. Should be interesting. Check out this bush. 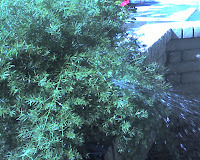 I guess when bushes have to pee, they have to pee. Or maybe it's a marathoner on the other side. Our thoughts and prayers go out to all those affected by the fires in southern California. Irene, in San Diego says she's safe. But, she's too close for comfort. The ironic thing is that in Arizona we've been blessed with a very mild fire season. I can't think of a single forest fire this year here. I'm sure a lot of our fire fighters are helping our neighbors. I know many of you are racing this weekend. I wish we could make signs for all of you, but this race was just around the corner, so we made one for Javamom. Check out her blog later today, hopefully she'll have a race report on her first sprint tri. I find it amazing that a black man in 1967 could sing such a song. He must have experienced so much bigotry and pain. And now in 2007 I complain way too much about the most insignicant things. I really like a lot of what Louis Armstrong did, I hope you enjoy this brief youtube moment. 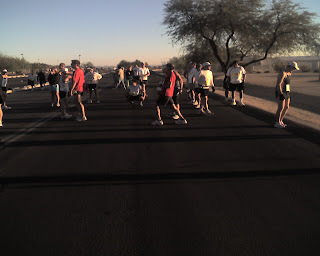 The Tumbleweed Running Club started at 6 am, way before the balloonists got airborne. Today the club consisted of Pokey, Pat and Jerry. Jerry googled his way to this blog and decided to join us this morning. He's recovering from some IT issues, but he does have a half marathon to his credit. He ran the inaugural rock n roll in Phoenix a few years back. Jerry ran and walked his way to the gas station and back for a 6 mile morning. Welcome Jerry, we hope to see you often. Pokey and I did the same and did an extra loop around Los Arboles park. Then Pokey did another mile on her own around Tumbleweed park. I ran the first 6.33 miles with Pokey and then did a loop up to the gas station and back to finish at around 12 miles. 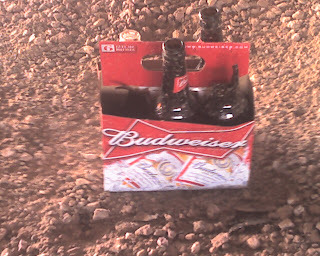 Since, Javamom couldn't join us, she got up early and left us some liquid refreshments out on the course. We figured either she had to sample or the other runners shared in our bounty. I sometimes drink from their water stops, so I guess that's fair. 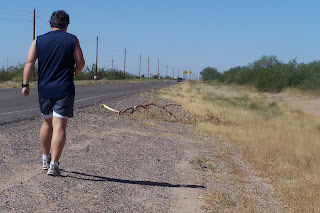 I planned to do my bizarre run today down near Casa Grande, AZ. As you can see by the photo above, the owners of the property did not want me. hill. You can't see the target course from the ground. 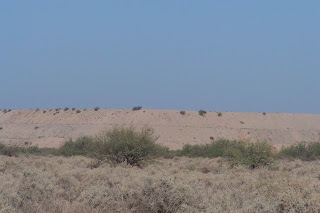 But, if you google earth it, you'll see that I was going to an abandoned open pit mine. A circular one that has a road to the bottom. 1.97 miles down and the same distance back up. I believe that's rain water at the bottom. My plan was to drive to the edge and ask permission if there was someone there. If not, I planned to start running. 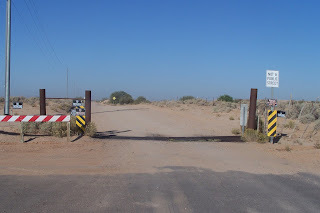 I drove on a road to the north and there was no access to the property. Just a sign that said keep out, private cattle ranch. I drove from the east and saw the gate above. I believe there's an entrance on the southwest side and when I have enough time, I will try that way. I still needed to get my run in for the day. I skipped yesterday because my legs felt tired. Today, I headed down to the heart of Casa Grande, AZ. Now, if you visit Arizona and only have one place to visit, do not pick CG. It's growing and might someday be a great city. Now, it's poor. Very poor. I ran through trailer parks and neighborhoods that are barely standing. Not thinking, I wore my red tech shirt. This morning I ran in a city that just busted a bunch of know gang bangers from the crips and bloods. Don't they shoot you if you're wearing the other gangs colors? Or is that just in the movies? I passed this neat looking church. 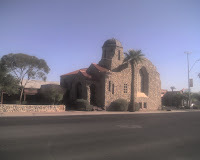 Casa Grande had a half dozen churches that I really liked. And that was just in the small area I ran in. I passed the city hall. 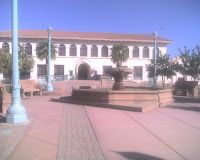 It's pretty big and has a nice fountain out front. The cities main park was across the street. I started my run in the parking lot of McDonalds and finished there too. 3.56 miles covered in around 42 minutes. I stopped for some traffic and a few pictures. Don't worry about the Bizarre Run. I have another ideal up my sleeve. And when I get to run in the pit, I'll let you know. Bob keeps the lead and Jeff passes up Dan. But, Phil the player got eliminated and that's going to hurt many of us. I can't believe Bryan voted for Phil. This is where Phil and Amy needed to team up and eliminate Bryan. Oh well. Hope everyone enjoyed the show. Like they say, 'it's a game'. I ran last night around 7 pm. I thought I would get up this morning and find that my legs were dead. But, not the case. I felt pretty good. I wanted to rest today so that I could maybe do my long run tomorrow in Casa Grande. I need to get a 12 miler in. So, I rested by doing a quick two miler this morning. 22 minutes and 28 seconds later I was done for the day. 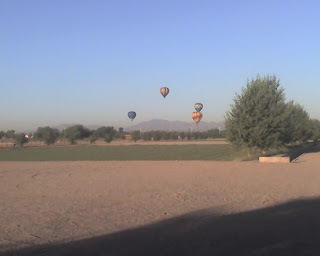 Tomorrow, if my legs feel fine I will head on down to Casa Grande and get 12 in. I, also, plan to check out the city. Afterall, I'm a Realtor and this city is only about 30 minutes away. I've never been to it. The Biggest Loser and my on Battle of the Bulge. tonight is the biggest loser. Everyone has their teams in place in the fantasy league. Except Pokey. You still get to pick a guy. Good luck to everyone, especially Phil, Amy, Bill and Isabeau. 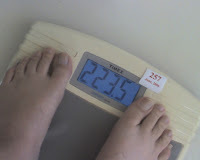 My weight today is 223.5. I am down 6 pounds from last Tuesday. Of course those was the easy ones. Margie, my sister and competition in our own weight loss battle is down about 4 pounds. It's gonna go down to the wire. Amy and I bought 8 sturdy bags that she takes to the grocery store each time she shops. One, they are much easier to carry. Two, they keep us from using those plastice bags that are usually thrown away into landfills. Did you know that plastic can last up to 300 years in a landfill. Next time you run, look on the ground and see how many plastic items are littering our streets. Ohh, I'm not doing that again. But, it is the fourth day that I've run in a row. 8,3,3,6 miles for a total of 20 miles in 4 days. Tonights run was to Desert Breeze Lake. Then about 4 laps around the lake, saying hi to all the walkers and the two runners. One guy was flying. It looked like he was doing 6 or 7 minute miles, but he wasn't dressed like a runner and he always had a smile on his face and said hi to me. Most fast runners don't have time to say hi. At least not to a plodder like me. Then it was back home. Of the 6 miles, 5 1/2 of them were running at a 11:33 pace. The rest of the mileage was walking and drinking. No calorie intake on this run. No gels, no sports drink. Just water and watermelon at the end. I would guess the watermelon had about 50 calories. Calories burned - 1050 approximately. This is the day you'll read a lot of blogs about the environment. I said I would add my two cents. So, for the next 20 posts I will tell you what I do to help save the environment. Do you know when is the best time to fill up your car? Yes, when it's on empty. But, also at night or early in the morning. Something about less vapors escaping into the atmosphere. I tried to google the answer and I found this site, not exactly what I wanted but very interesting anyway. I really like the design of the RFTC tee, but not the colors. It will be made into a quilt and not worn. 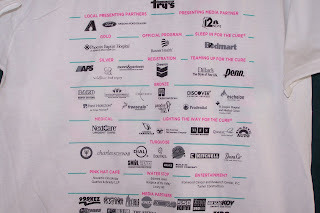 The back of the tee had a lot of sponsors. 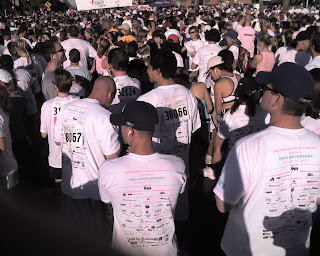 Not sure how many people participated in this years race, but I believe it was in the tens of thousands. Most were walking and they had a separate start time. 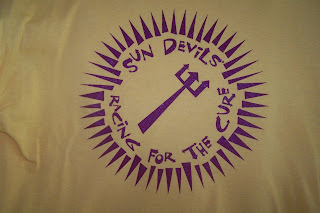 The great thing about being on the Arizona State University Gold team was I got two, yes two t-shirts and the ASU tee was really cool. It's one I'll wear. I believe I won this race. First out of 20,000 registered runners/walkers. Since it is a non-competitive race with no clock, you'll just have to take my word for it. I had my garmin, so I was able to time myself. Garmin gave me a 3.11 reading about 20 feet from the finish line, so that is when I stopped the timer. It read 32:23 for a pace of 10:24. I was pretty happy with this, especially when I saw my splits later on. Mile 1 - 10:24, Mile 2 - 10:21, Mile 3- 10:28, mile .11 - 10:19. I've never had splits that consistant. Not a PR, but a good effort. This is the view of the start line moments before the gun sounded. The RFTC is unique in that almost all the runners wear the race shirt. Or if they are on a team, they wear the current years team shirt. I wore my ASU Gold shirt with pride. 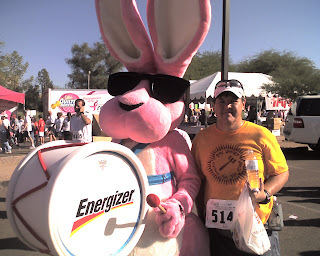 Today I felt like the energizer bunny. I kept going and going at a nice steady pace. Today was the first race I've run that I didn't walk thru the aid stations or take any other walk break. I ran straight thru to the finish. I've run further without a walk break, but never an entire race. The Corporate Village was nice too. I was able to pick up a bunch of stuff, including two nice hats, a pin, 2 visors and a couple other things. Unfortunately, they were all more sort of girly. I gave them to my wife and daughter. Bizarre Run Month is here. Are you up for the challenge? You must do a bizarre run before Halloween. Now you can do a Halloween run where you dress up in costume or you can run somewhere you wouldn't normally run. I have two ideals. I might have to scale a fence and run illegally at one place. The other place is more family oriented. Either way I'll have my Garmin to track my every move and you know I'll take pictures. On October 31st I'll have my bizarre run report and I'll link to yours. We can even have voting to see who came up with the craziest ideal. 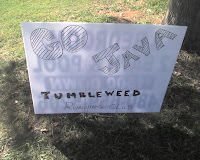 I did my long run today at Tumbleweed Park. My pace was up and down and all around. But, it was a beautiful morning and I saw about a half dozen other runners too. I wanted to get it out of the way, so I could do two short runs over the weekend. Tomorrow a 5 miler and Sunday I will be doing a 5k at the Komen Race for the Cure. 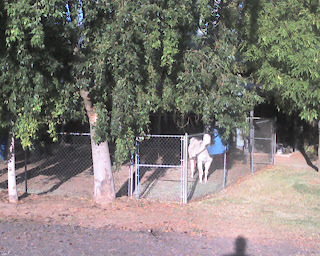 I did see two llamas having breakfast this morning. Didn't see them any other time. 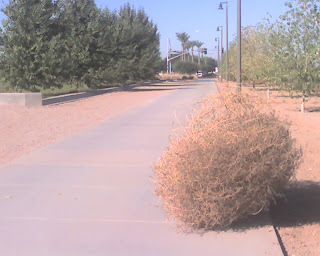 But, maybe the members of the Tumbleweed Running Club kept me distracted. Anyway, I ran up to Ray Road and back. 8 miles in 1 hour and 42 minutes. Both halves were about the same time. I tried to do negative splits for the halves an if you take out the pit stop at the gas station, I probably did the negative splits by seconds. My old sister Margie challenged me to lose 10% of my body weight by December 1. She's going to do the same. Whoever loses the most percentage gets a $50 gift certificate from the other. I'm game and I'm thinking I want something from the PF Chang's Rock and Roll Store. Yeah, I'm already spending my winnings. I'll post weekly, so that everyone can see me crush my sister. Oh, sorry I meant to say older sister above. It's a Rocky Road when you're trying to lose weight. You know you have a problem when you watch the Biggest Loser and eat Rocky Road Ice Cream. Yes, I did. More on that later. After the show, I went for a run. I like to run and I like to eat. 5 miles tonite in just over an hour. I felt good in the beginning. Legs felt tired in the middle, but then I recovered in the end. You can see in the graph, all 3 of my walk breaks were in the middle. 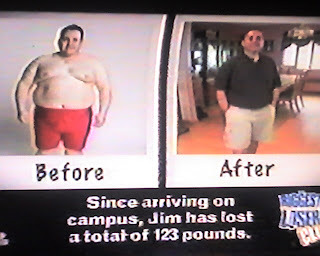 Jim is gone on Biggest Loser. Jim is one of the twins. The three ladies and Jez teamed up to out him. Which makes his brother, Bill a marked man. Bill better be the biggest loser on the black team every week if he wants to stay. Bob's Waddlers and Dan's Eliminating the Excess are one and two in our Fantasy League. Check out the standings and visit the blogs of each team. Some of our team owners could have competed well on this show. Speaking of losing weight. . . I'm not doing so well. Yeah, the toes are scary. What's worse is the number 229.5. 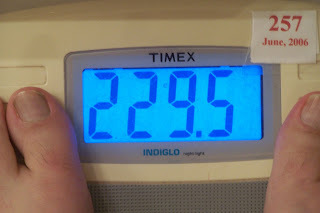 I've been in the 220's all year. I burn alot of calories, but I eat just as many. So, this is my time to make a stand. I am going to be under 210 at Thanksgiving. 43 days to lose 20 pounds. 0.465 pounds a day. Each Tuesday you'll get to see the scale and my progress. Wish me luck. Running was made for days like today. My car's thermometer read 47 degrees Fahrenheit as I was driving south into the desert. By 7 am it wasn't much warmer and I was deciding if I needed to wear my 'Ohio State Buckeyes' sweatshirt for the first part of the run. Note to self: buy some cheap sweatshirts at goodwill for future events. I did that for two earlier halfs. I wasn't willing to lose my OSU sweatshirt and I was getting used to the temps. I got down their about 40 minutes early. Perfect to get my bib number, tee and go to the bathroom. I got to the starting line as the announcer told us that the half marathoners should go to the line. There was between 30-50 runners. It was a small race. I think the photo shows the full field. At 7 am we were off and running. After a few hundred yards I checked my garmin and it said 8:30 pace. I as mad because I thought my garmin was on the Fritz again and I wouldn't have data. Then I realized that I was flying with the rest of the pack and it was right. I quickly slowed down, but still did a sub 10 minute mile 1. Note to self: when running with a small group be extra careful you don't start off fast. 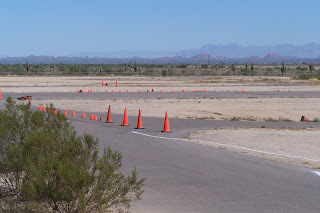 This is the test track we ran on. It was around miles 11 and 12. I had just eaten a double latte gel and was glad to be back on the campus of Central Arizona College, so this was a good place to be. At around mile 9 you run by these old buildings. 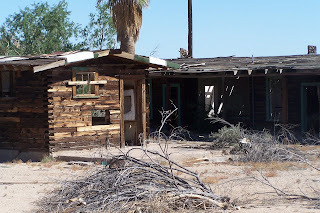 I think they used to be motel rooms. Now they might be good for fire wood. From miles 5 thru 9 you got a view of these mountains. Beautiful Arizona desert views. 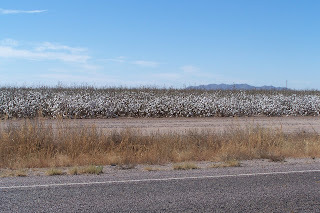 Miles 4-6 you ran next to the cotton fields. 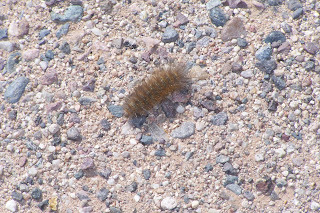 I guess caterpillars like cotton, because they were all over the road . Thousands of them and thousand more caterpillar stains on the road way. I ran these two miles looking at the ground to avoid these poor guys. Home for the caterpillars. The cotton fields. The back half of the race I walked some. My garmin says I walked a total of 1.16 miles for 18 minutes or 8% of the race. It felt like I walked a lot more than that. It also said I jogged 87% of the time and ran 4% of the time. I think running is anything faster than 9:30 pace. Jogging is between that and 13 minute pace. I was pretty happy with my race. The first 7 miles I only stopped briefly at two aid stations and walked once to eat a gel. The second aid station I had to sit down and remove my shoe. I found a pebble. Mile 8 was tough and I did most of my walking then. But, soon I was back on track and kept moving. The last 2 miles was sort of an out and back and I got to see a few runners that were ahead of me the entire race. I passed a couple runners and then got to see who was behind me as I headed for home. I think 4-6 runners were between me and the truck with the slow runners sign. Not sure if they were calling us slow or telling traffic to slow down. The course was open to traffic. After 13 miles, I kicked it up a notch and finished with loud cheering from all those that finished before me. 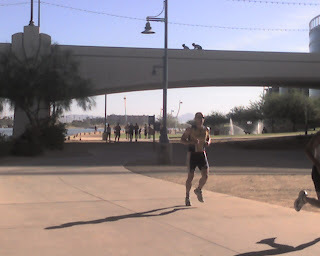 I crossed the finish line at about a 6:45 pace. Another Vanity Fartlek. 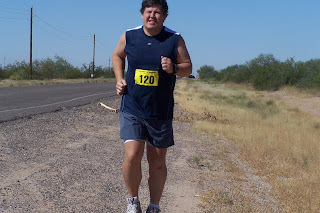 My PR for the half was 2:42:48 at the Valley of Gold HM in Tucson last March. I wanted to do a 2:39:39 or better, but was doubtful I could pull it off. Today I ran a 2:34:49 according to my garmin. I think the official time is a couple minutes more. Not sure how that could happen. But, either way it's a PR! Note to readers: I took all the pictures after the race. I even staged the running/walking pics of me. My time would have been much worse. there were 35 civilian runners and 21 police/fire runners. I finished ahead of 4 of them. On the way back in I high fived everyone behind me and later went out to the course and cheered 3 of them in. You might notice they butchered my last name. No big deal. Not sure how there was a 2:32 difference in the official clock and my garmin. I started the garmin when the starter said go and I crossed the start line within seconds. My garmin does have some stopped time and I know it paused at a water stop. So, I'll use their time as my new PR. I set PR"s for 2 miles, 3 miles, 4 miles, 5 miles 10k, 10 miles and of course the half.